The Arius series is known for being one of the most premium digital piano lineups from Yamaha, next only perhaps to the Clavinovas. The Yamaha Arius YDP181, on the other hand, challenges the top end of Casio’s and Roland’s digital pianos and as such, must be able to offer better and more features compared to its cheaper sibling without producing useless bells and whistles. Yamaha claims that the unit does exactly this, adding AWM sound, advanced damping, touch sensitivity and improved bass and sound sampling. While our testing proved that most of these features do add to the utility of the unit, we found that in some aspects like MIDI compatibility, Casio’s range beat the YDP 181. In the light of these, is the unit still a great value for money proposition? Let us see by means of a detailed review. 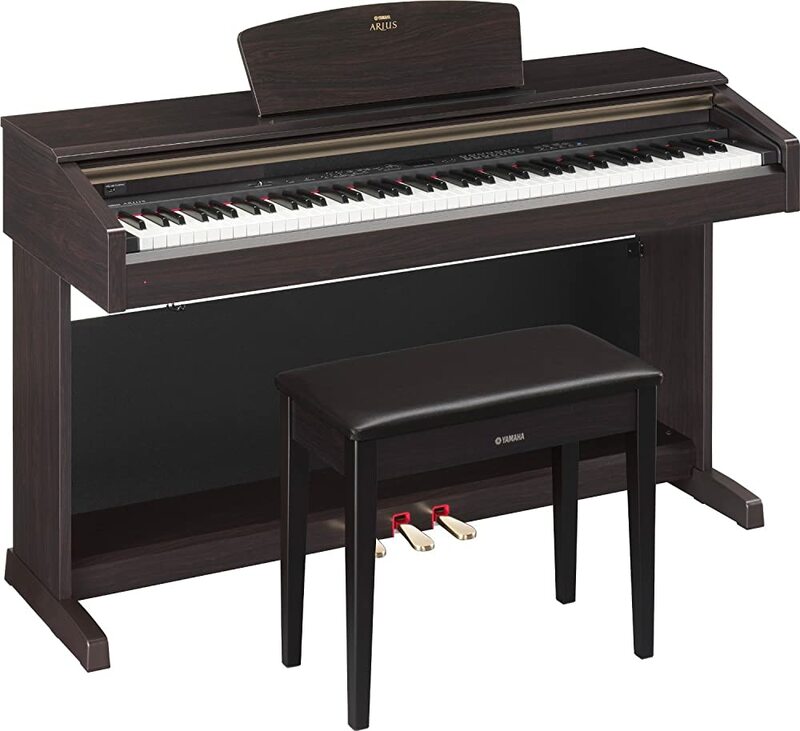 Being made of high quality wood, the piano, stand and bench configuration adds up to a whopping 110 pounds. Unless you have it delivered to your doorstep by online retailers like Amazon, you may be forced to request delivery at additional cost given the weight and dimensions. Once the parts are unpacked though, moving them around separately or even in assembled state is not difficult. While we did not have any issues moving the unit over a carpeted floor, some users who had hardwood floor warned that moving the unit may cause the floor to be scratched. The package itself came with the assembled piano, the side and back board, the pedals and the bench. Putting the parts together is the task of not more than one adult working for about half an hour. The unit has to be raised to the side so as to attach the side and back boards. This is followed by installation of the pedals and finally, the bench is placed before it. Once done, all you need to add is the power cord. Coming to the build quality, many users found it to be extremely sturdy. The wood on all parts was thick enough and did not wobble or budge during rapid playing. One exception to this rule was the back board which one user found to be redundant and perhaps for this reason, somewhat thin. As you’d expect after reading our reviews, a high-end unit like the Yamaha Arius YDP181 can be expected to have a three-foot pedal. Like the YDP162, this pedal is a three-foot variant that is capable of providing a range of options (which we shall see below) without suffering from instability. It should be noted however that the adjuster of the pedals needs to be in constant contact with the carpet or the floor so that the unit is not damaged when the pedal is pressed. The keys are vital to differentiating a lower-grade piano from the Yamaha Arius YDP181 and even the YDP162 from the YDP181. The latter has special graded hammer action that some considered to be an improvement on the YDP162. One user noted that compared to an acoustic, the only difference lay in the lack of “let-off”. Users who felt that the keys were too soft discovered that the piano has three playing settings (touch settings). Pushing the settings to the hardest level gives a realistic acoustic experience while lower settings are good for those who wish to remain in the realm of digital pianos or are just moving into the intermediate levels. Another impressive feature was the excellent sensitivity to the velocity of the user’s performance. While there are differences with the acoustic and the grand, the overall concepts have been adhered to here and this gives the user sufficient practice for playing the grand. Together, these allowed many users to realize that this unit fared better than the comparably priced Casio AP620. In this price bracket, a matte textured key surface and high quality key construction are taken for granted and users mentioned in passing that Yamaha met their expectations. One of the users found that the Yamaha P-155 provided a similar key design but admitted that it lacked many of the other features that made the Arius attractive. Moving beyond the keys, we noticed that the pedals were extremely similar to what acoustic pianos use. As expected, the pedals can register the half-press as well as the complete press. One user was of the opinion that the middle pedal is not very useful as most compositions come from Europe. Further, the pedals are in general somewhat hard to press and would be somewhat difficult for someone moving from the lower-end of the piano spectrum. That said, this difficulty is again consonant with that present in real grand pianos and would serve as good training for those seeking to graduate to a Steinmeyer or similar piano in the future. Finally, we notice the presence of a wooden music sheet stand. While it is sufficient for day-to-day playing, some of the larger music sheets may prove to be too large for it as it is somewhat narrow. That said, it is sturdy and should not have any problems accommodating large books as long as they have reasonable dimensions. Sampled from a CFIIIS, the Yamaha Arius YDP181’s primary piano voice is one of the best in the industry in the opinion of most users. We found that on some of the higher notes, the piano produces a somewhat electronic expression and this is enhanced by the presence of the damper. However, others noted that the “brightness” or “mellowness” of the sound could easily be adjusted to suit the tastes of the user. Beyond the standard Grand Piano 1 voice, there is a second grand piano voice that offers a somewhat more “muffled” tone. Again, the degree of variance can be modified to suit the needs of the user. Aside from the piano voices, there are the standard organ and harpsichord ones that provide adequate variation to the user who needs them. Coming to acoustic features, it is interesting to note that the unit offers the option of recording one part of the song and then having the unit play it along while you play the second part. While the bench is not capable of accommodating two persons at once for a duet, it is possible to play with another person or use it to teach/learn as well. For those who wish to use the unit as a learning tool, Yamaha has provided 50 songs that can be played from the unit itself. Most of these come out well on the 40W dual speakers and as such, do not require external speakers unless one is performing for a large group. Unlike many other pianos, the control panel of the device is located along the middle of the top bezel above the keys. The controls are relatively simple and can be used with ease even though there is no digital display available. Further, the controls do not take up too much space, allowing the user to use key combinations to achieve desired effects. In terms of connectivity, the unit comes with a MIDI in and a MIDI out port. These two can be merged with a MIDI to USB converter in order to achieve compatibility with some of the newer machines. As for interfaces, one user warned that using the Roland UM-1 interface would cause notes to be skipped. Yamaha’s own UX-16 is the best choice, though others may be considered as well. All this considered however, a few users warned that (as we noted in the introduction) the unit does not have the MIDI capabilities of a comparable Casio unit and for those who require MIDI extensively, this may prove to be a liability. Finally, there is a ¼” audio port that allows for speakers and earphones to be connected as per requirement. While the lack of excellent MIDI options is hard to excuse in this price bracket, one has to admit that the presence of excellent sound sampling and one of the best key systems in the industry allow the user to obtain an experience that is the same as that of a grand piano except in a few small details. Further, while many units have problems with the pedal and the speakers, the Yamaha Arius YDP181 excels in both areas. With there being a huge number of adjustability options, these allow the unit to act as one of the few digital pianos that can tick all of the tips for choosing the best digital piano for professional players. As such, whether you are an intermediate learner or a professional seeking the perfect instrument on which to perfect your skills, this product should be able to suit most, if not all, of your needs.